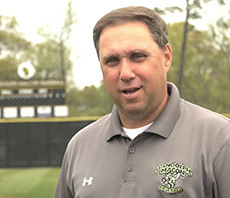 We're excited to talk baseball, and more, with Randolph-Macon head baseball coach Ray Hedrick live this Monday night at 6pm on 102.9 The Mater on "In The Red Zone"! We'll be live at SportsPage Grille Ashland, so come out for dinner and enjoy the show! If you can't make it out live, listen on the radio, or online by clicking HERE, or on the TuneIn Radio App on "Radiall"! Live, local sports talk, every Monday night on 102.9 The Mater!